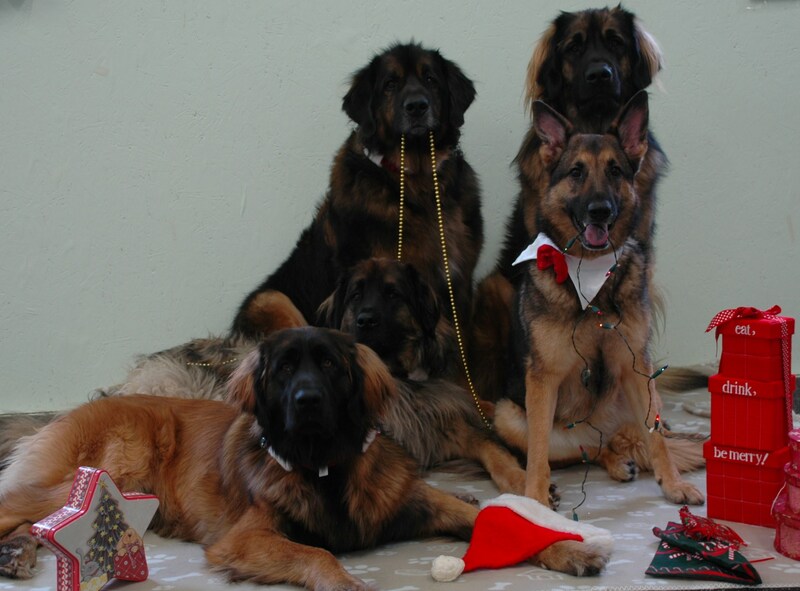 In our house around this time of year we start thinking about taking a family photo for our holiday newsletter. Subjects in the photo are varying numbers of dogs, depending on the year (the cat always seems to have good excuses for not being in the photo) and us most years. Some years we have good excuses for not being in the photo, too! Inevitably, without fail, at least one person will ask “How did you get them all to sit there?” To which either my husband or I will answer “We told them to”. Honestly, many people forget this, but obedience commands have their place in everyday activities…such as picture taking. A simple SIT or DOWN depending on how you want your photo composed is a start. The attention command such as WATCH gets the dog looking at you who has the camera so therefore…the dog looks at the camera. Simple. Well, simple for one dog. It gets a little more challenging with multiple dogs. The more dogs, the better the obedience will need to be. For those occasions when you want to be in the photo with your dog, unless you want your dog looking at you when you take the photo, the WATCH command won’t work. WATCH means to focus on you. You can teach a separate PHOTO or LOOK command to get the dog to look away from you and to whatever it is you want them to concentrate on (in this case the camera). If you don’t have time (or the desire) to teach a LOOK there are a couple tricks to get your dog to focus on the camera (or at least the direction of the camera). These tricks still require solid enough obedience for your dog to hold their SIT or DOWN commands in mild distractions. If you’re using a helper to take the photo for you, have them make interesting sounds, shake a treat box or squeak a favorite toy. If you’re using a tripod to take the photo yourself (with a remote or a timer) try throwing a treat bag or toy in the direction of the tripod just before the shutter releases. Be aware the dog’s gaze will be wherever the object ends up so practice throwing before taking your photos. I’ve also hung something of interest to my pack from the tripod with a small line to where I would be seated. When we were ready, I’d tug the line slightly to move the toy or feather or whatever near the camera. 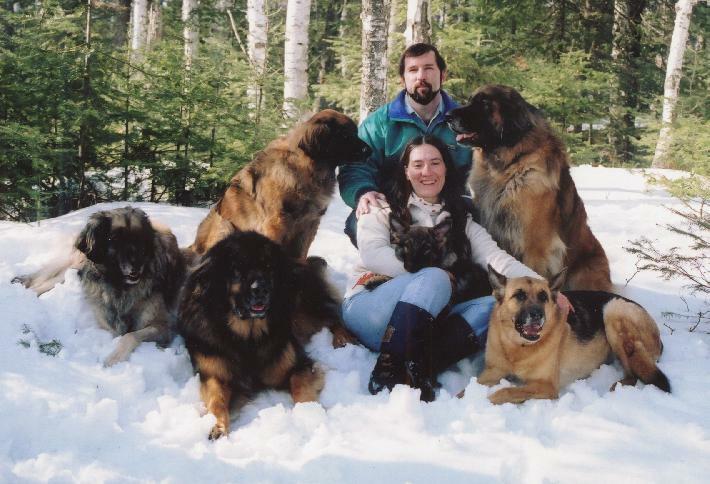 Dogs focused there and viola, family photo. Here are a couple photos from years past. We’re still waiting for snow for this year’s attempt. Oh, and remember to HAVE FUN and BE PATIENT. Thank a Veteran — those still here and those who’ve left us! I came home from a lesson Thursday night to find a tri-colored dog curled up on the bed next to Mark. Not a thing to get excited about usually. Seda hangs out with her “dad” like that a lot. The factor making this event exciting was the dog was a longer haired tri-colored dog named REPOE! RePoe was hanging out on the bed like our normal pack! This was awesome. Could it be he knew it was the 8 week anniversary of his arrival here and wanted to celebrate? Woo Hoo! Friday when I got home from another lesson, Mark informed me not only had RePoe ventured out and onto the bed on his own with no prodding, he actually tried to participate in a play session! Ledum and Seda were on the bed wrestling. RePoe could no longer contain himself. He did a play-bow and a couple feint & perry swats at Ledum who was concentrating on Seda. He then wagged his tail (a first here) and took a couple swats at Quigley, who was also uninterested. Not a big rip-roaring play session for the first try, but it’s a first try! We’re hoping this is the crack in the protective armor this dog developed to survive his past. We’re looking forward to the flood of true dog-ness that’s been bottled up to gushing forth soon.